It’s not unusual for me to leave things around. A pile of papers here, a book there – I’m always so busy! I think, ‘I’ll sort it out later, or tomorrow or maybe on the weekend. …’. So it was no surprise that I had left out some paper letters after I had photographed them for a new ABC activity book I am writing (sorry – this was not meant to sound like a ‘coming soon’ promotion!) . They were just on the table when Belle came home. Like a moth to a flame Belle went straight to them. She had a quiet look through them then asked me if I could help her stick them on her castle. We placed them all over the castle, not saying much at all. Then Belle started to ask questions. And her self directed exploration went on. Just by answering her questions we talked about letters in her name, the shape of the letters, the names of letters and the sounds they make. And none of it was instigated by me. This really got me thinking about giving Belle the opportunity to explore and discover things for herself. 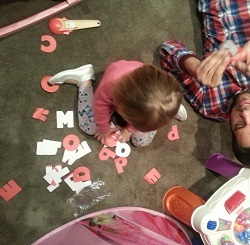 Maybe it’s putting the alphabet magnets on the fridge or a box of dress up clothes in the lounge room and just let her find them and see what happens. Placing things in our home environment for her to discover and explore is great for several reasons. Firstly, it’s that feeling of ‘Wow, what’s this?’. This then leads to finding out more -looking at it, feeling it, playing with it. Then, if and only if, she is interested or ready to find out more, she will ask questions. And those personal discoveries can form into the best kind of learning – finding it out for yourself. Of course it’s a little guided- if I’m putting out letters of the alphabet I’m hoping something will come of it. And it’s not just a ‘drop and leave’ thing- you do need to be in earshot if the questions begin. You may also ask a few ‘I wonder….’ type questions to keep the learning experience developing. But if you don’t set up the situation, the opportunity is not there. Sometimes it’s more powerful and a better learning experience when your child takes the lead. Have no agenda and see what happens! And more often than not, your child will take this opportunity in a better, more rewarding direction than you could ever imagine! That’s right – you create the environment that encourages exploration, questioning and discovery: a great way to learn! It’s funny though – as a teacher, setting up the right environment in the classroom came naturally. Now that I’m a Mum, sometimes I am prone to over think things and forget about the basics! Providing the opportunity, encouraging discovery and keeping it simple seems to be the way to go!